Like the populations of many African countries, Mauritians are football mad. The game played in stadiums and streets all over the palm-fringed Indian Ocean island is a legacy of 19th century British colonialism — administrators, missionaries, soldiers and sailors introduced the game to locals — whereas in other African nations it was popularized by the Portuguese and French. Traditionally, Mauritius split into two more or less equal groups — those who supported Liverpool and those who supported Manchester United. Now, because of increased television coverage and the easy availability of football merchandise, especially branded t-shirts, other UK Premier League teams like Arsenal, Chelsea and Manchester City are gaining support as younger people choose different football clubs as vehicles for sporting and other identities appropriate to their age sets. But Mauritians from all of the country’s diverse ethnic groups — Hindu, Muslim, Creole, Chinese and French — know that a Frenchman of Mauritian descent — in fact, of Hindu Telugu heritage — Vikash Dhorasoo, a member of the French team at the 2006 FIFA World Cup in Germany, was one of the most gifted midfielders in modern times. The former AC Milan, Lyon and Paris St Germain player is also the most prominent footballer of South Asian descent in the history of the game, and very well known for his views on the importance of combating racism, homophobia and gender discrimination in sport. The regret among Mauritian football fans is that Dhorasoo never played for a Premier League team before his retirement in January 2008. However, he did visit Mauritius in May 2009 to promote FIFA’s Grassroots programme, which was inaugurated on the island. The Mauritius football team did not make it to the current African Cup of Nations, the finals of which are being co-hosted by Gabon and Equatorial Guinea. But the country is following the championship closely through local and international TV channels and local press coverage. Significantly, Mauritius along with Zimbabwe, another former British colony, has been part of the FIFA Medical Assessment and Research Centre’s research into “11 for Health”, a football-based health education programme for young and teenage children. It had previously been piloted in a smaller study in Khayelitsha township in South Africa in 2009. 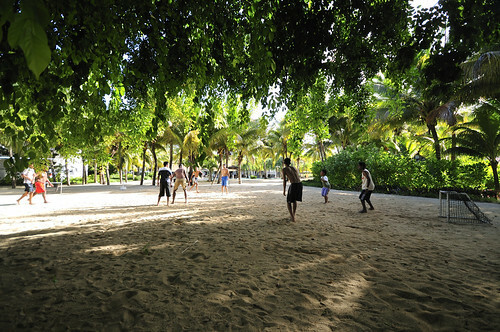 In Mauritius, 389 schoolchildren, boys and girls, aged 12-15 years, at 11 secondary schools took part in eleven 90 minute sessions which combined learning or refining a football skill with linked information about 10 health issues – for example, heading a football and avoiding HIV infection, defending well and washing one’s hands, shooting for goal and vaccination for self and family, building fitness and eating a varied diet, and good teamwork and fair play. The study was conducted between February and June 2010. Questionnaires assessed participants’ pre and post-intervention health knowledge as well as views about the “11 for Health” programme. The results carried out in co-operation with the Mauritius Football Association and the Mauritius Ministries of Heath and Quality of Life, Education, Culture and Human Resources, and Youth and Sport were extremely positive. The results among a similar group of children in an out-of-school setting In Zimbabwe were also excellent.That said, it would have been useful to know something regarding the ethnicity, social class and geographical location (urban vs. rural) of the Mauritian schoolchildren in order to more fully assess the relative importance of other sources of information available from families, peer groups and mass media on health issues. But there can be little doubt that using football, the most popular game globally for adults and children, to increase knowledge of health issues is likely to be an effective social marketing tool among many groups in many countries. Which goes to prove as the old saying goes that football isn’t just a game, it’s a way of life. It is great to see that cultures are able to find things from other cultures and bring into their own. I believe that it is good for someone to look to other cultures and take someone the good things from that culture into their own.